The microstructure and partitioning behaviors of alloying elements in the γ and γ′ phases in Ni-based powder metallurgy superalloys with different Ti and Al contents were investigated. The results showed that Ti and Al were mainly enriched in the γ′ phase, partially partitioned in the γ matrix, and slightly distributed in the carbides. 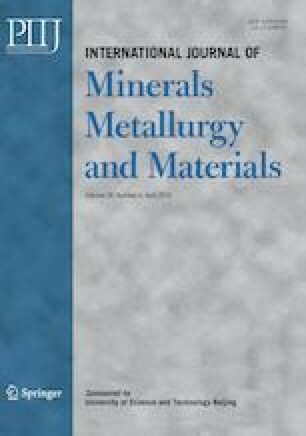 Different Ti and Al contents in various alloys influenced the composition and amount of MC carbides but did not influence the MC carbides’ morphology. With increasing Ti and Al contents, γ + γ′ fan-type structures formed at the grain boundary, eventually resulting in a coarsened γ′ phase. In addition, the morphology of the secondary γ′ phase transformed from nearly spherical to cuboidal. The saturation degrees of Cr, Co, and Mo in the γ matrix were substantially improved with increasing Ti and Al contents. This study was financially supported by the Guangdong Provincial Key Laboratory for Technology and Application of Metal Toughening (No. GKL201611), the National Natural Science Foundation of China (No. 51571020), and the Fundamental Research Funds for the Central Universities (No. FRF-IC-17-002).